They can be traditional concrete fence gates with ornamental accents such as wrought iron pickets, or they can have architectural details such as geometric shapes, logos or initials incorporated into the fence gate design. After installation, they are coated with a stained sealant to protect the concrete from the penetration of the moisture elements such as rain, sleet, and freezing of the same. Fence Wall color options are limitless, ensuring the fence looks natural and complements nearby buildings and foliage. StoneTree® Fence Walls provide a low maintenance landscaping alternative to more traditional fencing systems. 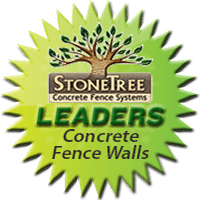 StoneTree® Precast Concrete Hurricane Fence Walls are engineered and manufactured in accordance with local hurricane codes, to ensure that the fence wall will withstand the required category of hurricane force winds. are formed vertically using Combo-Cast™ Technology, whereby the wall panel and column are cast as a monolithic unit. Each section is 15’ in length and available in various fence wall heights. StoneTree® Combo-Cast™ Walls are designed to weather storms without breaking, cracking or falling over. Fence Wall Panel wraps securely around the Rigid Footing Support System’s structural support, which is embedded into the caisson footing, protruding up into the column portion of the wall section.